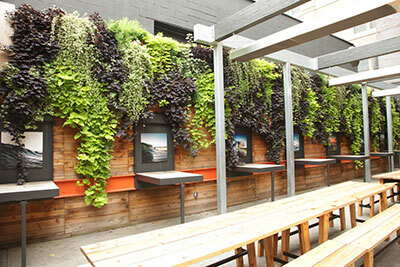 Green space Green wall suppliers like LiveWall offer a solution to the limited green space in urban areas. As cityscapes expand outward, some landscape contractors have decided to grow upward by including green walls as an add-on service. Green walls—also known as living walls—are vertical gardens that are attached to the interior or exterior of a building. These applications have gained some traction in the past five to 10 years, particularly with commercial and retail clients, but also with residential clients. Landscape professionals and green wall suppliers offer up their advice for those looking to add green walls. “I think it’s a really good fit for those who want to offer something beyond the traditional landscape, especially in urban areas, as the footprint available for traditional gardening shrinks,” says Amber Ponce, business development manager for LiveWall, a supplier of green walls. The service may be one way to earn revenue besides snow removal during colder months, she adds, when many landscape companies lack installation and maintenance opportunities. Green walls provide a variety of human benefits. In addition to the aesthetic quality, experts cite lower stress levels, increased productivity, lower noise levels within buildings, increased oxygen levels and decreased common cold ailments as just a few of the positive takeaways. Professionals also mention the importance of a biophilia connection, referring to the human tendency to seek a connection with nature. 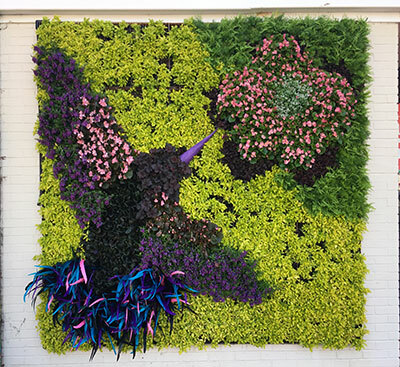 Whitney Griffin, a lecturer in the department of horticulture sciences at Texas A&M University, adds that many firms try to use green walls as a symbol of their commitment to sustainability. While green walls provide many benefits and may give off a sense of sustainability, some professionals are concerned about the cost—financially and environmentally—of these systems. In terms of design, there are many options, including soil-based, pocket plant, fabric-based and tray systems. Some variables to consider when designing and installing green walls include irrigation, lighting, monitoring systems, location, wall size and plant palette. Greenscape replaces the designs for its shopping center walls twice a year to engage retail customers. “Trial and error is really the only way to figure out what works best for your application,” says Leslie Herndon, president of operations for Greenscape, a commercial landscape company based in Raleigh, N.C.
“For landscape contractors to add green walls, they need someone who is going to own it and make it happen,” she adds, noting that the systems require a high level of creativity and inventiveness. Greenscape’s living walls are primarily located in outdoor shopping malls and are replaced every October and May. “The outdoor living retail (setting) works really well because you’re adding value for people and keeping people at the shopping center longer,” Herndon says. The company has been offering exterior green walls for about five years and does all the design, installation and maintenance work for its walls. The contractor buys a preassembled design, installs and maintains it. Some suppliers like LiveWall offer resources such as video guides and design service packages that include custom drawings for each project. Ponce says it’s important to thoroughly research the supplier before presenting a project to clients because some suppliers have exclusive installation and/or maintenance rights in certain regions. If a contractor wishes to work with such a supplier, he would have to subcontract the installation to the supplier or the supplier’s exclusive local contractor. When calculating price, many contractors charge by the square foot. Factors include wall size, location and height, plant selection and installation equipment—such as large ladders or lifts. Some contractors use a dedicated crew for every installation. In addition to retail centers, apartments and hotels are target clients for landscape contractors, as is the residential sector. Raimondi notes that young members of the workforce are demanding green elements within the workplace. “The younger people work in a different regimen than older people. And green walls fit that category,” he says. Green wall suppliers and landscape contractors alike cite the importance of diligent maintenance for any green wall system. Monitoring systems can be as complex as using web-based applications or as simple as a biweekly in-person inspection. Environmental factors such as wind and temperature—especially for outdoor systems—need to be monitored as well. Irrigation is also key. Techniques include hand watering, drip irrigation, reservoir systems, sprinkler control valves and drip-free systems. Another important maintenance factor to consider is lighting. For interior walls, a window doesn’t always provide enough light for the plants to thrive due to the window’s glazing, according to Griffin. Therefore, contractors may need to install LED lighting systems, adding electric to the list of maintenance costs. For outdoor applications, proper pruning is also vital. To compensate for such maintenance services, many contractors bill clients monthly, based on variables such as service time, plant varieties, lighting and accessibility. Others include one to two years of maintenance fees in the installation contract. “I think there’s a lot of potential market there, but I think the reason no one has really thrived at (green walls) yet is because no one’s making money at maintenance because eventually, something’s going to happen, and that wall’s going to die,” Griffin says. But there are ways to prevent living wall failures. For example, Griffin advises that landscape contractors not only budget for maintenance but also revisit their warranty language to account for potential maintenance issues. Additionally, it’s important for landscape contractors to interview the potential client and visit the site beforehand to ensure the desired system is plausible. The National Association of Landscape Professionals (NALP) recently moved its headquarters to a new space in Fairfax, Va. 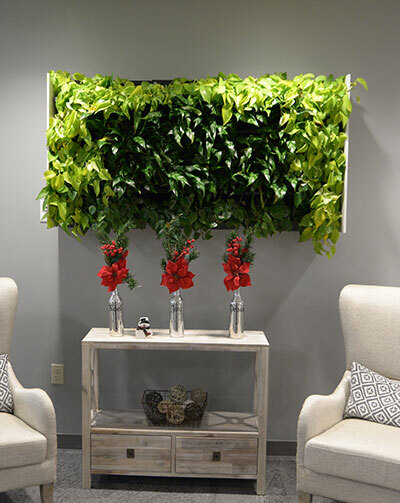 Upon hearing the news, NALP members Chris Raimondi of Raimondi Horticultural Group and Connie Hom, president and CEO of Buckingham Greenery, donated a living wall for the new reception area. “We wanted to give them a taste of the interiorscape sector,” Raimondi says. The project was funded with equal donations from Raimondi Horticultural Group, Buckingham Greenery and living wall supplier Architectural Supplements. Raimondi and Hom met at the headquarters, and in less than three hours, NALP had a new—and aesthetically pleasing—conversation piece. The team used the Next Gen modular system and three types of plants: ‘Emerald Beauty,’ Philodendron and the ‘Neon’ Pothos. For irrigation purposes, the plants stay in the pots and sit in trays of water that have “sipper” straws to deliver the water. Track lighting was installed to supply the plants with an even light source, says NALP.